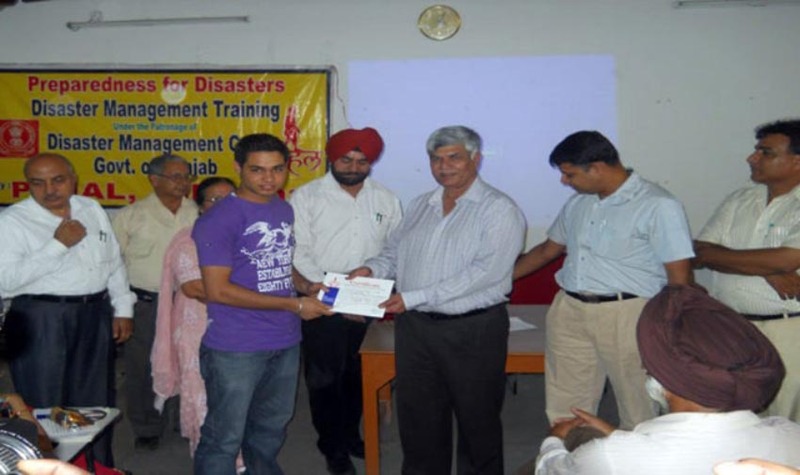 The afternoon of 29th May, 2011 saw the final evaluation and concluding session of the ‘First Aid and Disaster Management Training’ Programme organised by PAHAL, at DAV College of Physiotherapy and Rehabilitation, for the staff and students. The ten day programme held in collaboration with the Red Cross Society of India and St. John’s Ambulance Society India was an endeavor by PAHAL to create prepared, educated and holistic citizens who are capable of helping not only themselves but others too in a situation of crisis . The afternoon began with Prof. Lakhbir Singh addressing the participants to gain feedback and suggestions about the programme. He talked about the different ways in which this programme had affected the students and their way of thinking regarding disaster management and training. Next, the participants of the programme took a 30 min evaluation test to check the knowledge they have gained throughout the ten days. After the test the official ceremony began and the guests were invited. The Head Trainer of the Programme Recieving token of appreciation.